One of the features I’ve been working on lately is unlockable bonuses in the form of so-called “wave challenges”. I really want to create a lot of opportunity for the players to strategize to achieve high scores – while also making the game harder. The player does something (for example, flap around a lot). 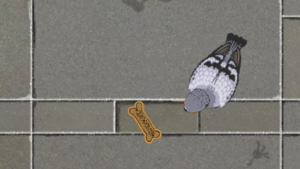 After a while of doing something, a special item drops (for example, a dog biscuit). 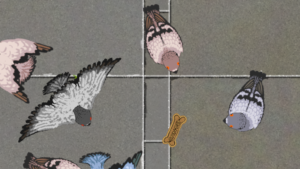 The player obtains the special item before any of the other pigeons do. The next wave will have an extra challenge (for example, the dog). Eventually, a challenge will reward the player with some kind of point multiplier for the duration of the wave. I’d also like these to be able to stack, so if the player has multiple challenges activated, the point multipliers would, well, multiply. These multipliers also would stack against the point multipliers from bonus foods. Basically, the harder you make the game for yourself, the higher score you can get. Which is really the whole point of this game, you know? I mean, never mind difficulty settings – let the player’s competitiveness set their difficulty. Other benefits of this – the player can (try to) plan ahead, activating challenges based on what the next wave is. Only get the biscuit if you can handle the challenge. Because there is no more dog wave. 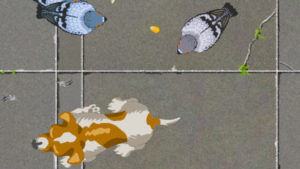 Now the dog can appear on any wave! A dog in the crowded wave. The dog running through the crowded wave is actually kind of fun to watch – maybe I’ll put together a video of it. Alternate endings – based on score, active challenges, player behavior, etc. These will help to tell my story – yeah, there’s sort of a story in the game, nothing big. Different kinds of foods and bonus foods – pretzels, ice cream cones, hot dogs – I’ll be adding a bunch. The bonus foods are like the fruits and vegetables in classic arcade games like Pac-Man, Dig Dug, Burger Time, etc. 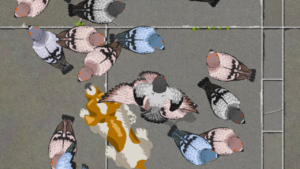 Fixing the collision issue so pigeon heads stop detaching from their bodies when standing too close to other pigeons (or so it appears). We’re getting close to the assets and polishing stage! 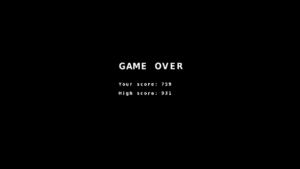 I added basic functionality to save the current highest score. It isn’t much, but it’s progress at least. I also did some more behind the scenes work cleaning up the code. But that’s not obvious in screenshots and videos.